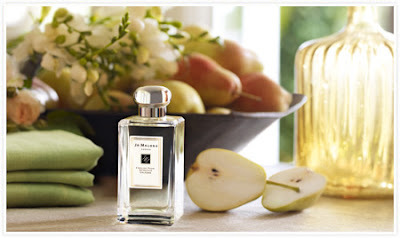 Jo Malone's latest scent, English Pear and Freesia, takes a graceful step towards autumn with light and fresh notes and contrasting earthy elements. Its keynotes are the King William pear and white freesia. The base note, patchouli, is usually too intense for us; but here it adds a simple woodsy undertone. We love that Jo Malone creates her frangrances to be used in conjuction with one another, whether you're creating your own personalized scent or matching your scent to an occasion. Combination suggestions for English Pear and Freesia include Orange Blossom for a sparkling effervescent edge; Vetyver for spiciness, and Black Vetyver Cafe for masculine depth. As for us, we'll wear it alone and enjoy the simple pear notes this fall. Jo Malone English Pear and Freesia is available September 2010 on jomalone.com, Jo Malone stores, Bergdorf's, Neiman's, Saks, and select Nordstrom's and Bloomies. This review was based on a sample.